I just had to share this album with you, especially since it ties in so well with yesterday's entry. 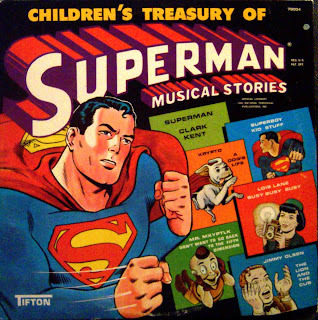 This album from 1966 features a bunch of fun songs about Superman and his cast of characters. There's two each for Superman, Lois, Jimmy, Superboy, Krypto, and Mr. Mxyptlk. What's fun is that a lot of these songs are supposedly sung by the characters themselves. For example, in the song "Lois Lane", the singer says, "I'll do it, I'll do it, I'll keep her in line even if it means changing her name to mine or my name isn't Superman!" And if you were hoping for a definitive pronunciation of the name Mxyptlk, you won't get it here. When Mxyptlk himself says it, it sounds like a cross between a chicken and the Tasmanian Devil! By the way, I've heard that there's supposedly another album of this vintage of Justice League songs. I've seen one from the 70's but not this one. Anybody here heard of it? Anyway, hope you guys like this, and I promise to throw some Christmas stuff in here soon! And by request, here's the back cover. It's not part of the zip file, so if you want it, you'll need to right-click and save the picture that way. I got it, too. Being a comic book fan(Superman in particular) I was thrilled to find this. Many thanks! I mentioned this on Beware of the Blog's MP3 Truffles post this week. Thanks for sharing great music! Could you please upload a scan of the backcover, if possible? Do you also have the album "Children's Treasury of Batman Musical Stories"? I'm searching many years now for this one..
A thousand thanks for posting this album! This is a wonderful piece of nostalgia. I'd love to hear that Justice League album some day. I have the full JLA record (containig all songs/stories of both Tifton & Power Records versions of the album). I could upload it if you like. Just let me know. Maybe someone around here knows wher to get "Children's Treasury of Batman Musical Stories"? I took a picture of the back cover (it's basically just a close-up of the Superman picture) and will try to add it here in the next day or two. Anonymous, I would love to get a copy of that JLA record. Email me when you get a chance, and we'll try to figure out a way for you to share it. And regarding the "Children's Treasury of Batman Musical Stories", I just won it on eBay last week, and I'll share it here as soon as I receive it and get it recorded! That sounds fantastic! The Batman album!!! You don't know how happy I'm right now. And if you'll also post pic's of the front & back of the record, you'll make me even happier. 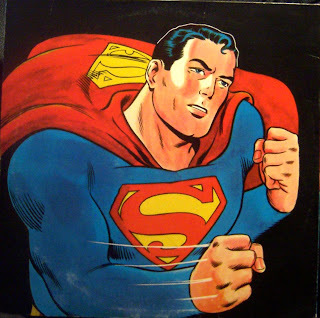 Many thanks also for uploading the Superman back! JLA is uploading right now (front & backcover will be included;) ), I'll mail you as soon as possible. The name is pronounced MIX-YEZ-PITTLE-ICK. My Very Favorite-ist Christmas Card Ever!